Don’t judge content by bounce rate alone. For advanced web analytics users, bounce rate is quite possibly the most popular stand-alone metric — Bounce Rate can be the “sexiest” web metric ever. It’s certainly should be top of your list. 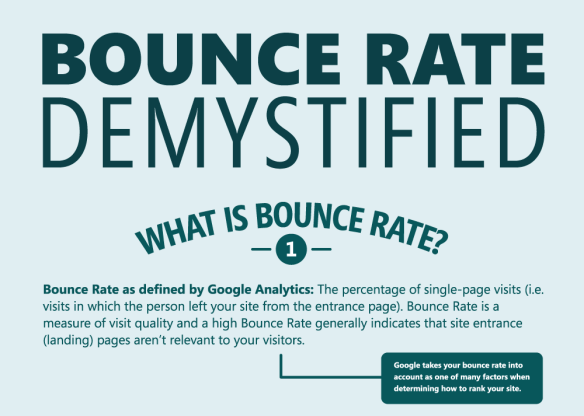 Google defines bounce rate as “the percentage of single-page visits or visits in which the person left your site from the entrance (landing) page.” It’s great because it tells you right away that something is wrong with your website. Or does it? Analysts typically use bounce rate as a measure of poor quality content — or as an expression of dissatisfaction with your site. But bounce rate has a lot more to say than simply “your website stinks.” In fact, it might even say something good! Every web metric has more than one angle. As with all web metrics, we need context to provide meaningful insights. Maybe one bounce means a visitor left because she immediately found what she was looking for or bookmarked the page to view it later. Every web metric has more than one angle. Look at “time on page,” often regarded as a positive stand-alone metric. Surely, the longer someone stays on your page the more engaged they are with the content, right? But maybe a long time on page means the visitor had a difficult time using or understanding the content. 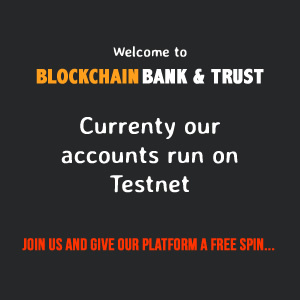 One metric never says it all. What’s the Value of a Visit Without Action? 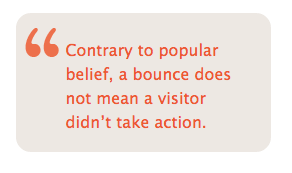 Contrary to popular belief, a bounce does not mean a visitor didn’t take action. Answer: likely, none. Indeed, great content moves people to action. But contrary to popular belief, a bounce does not mean a visitor didn’t take action. 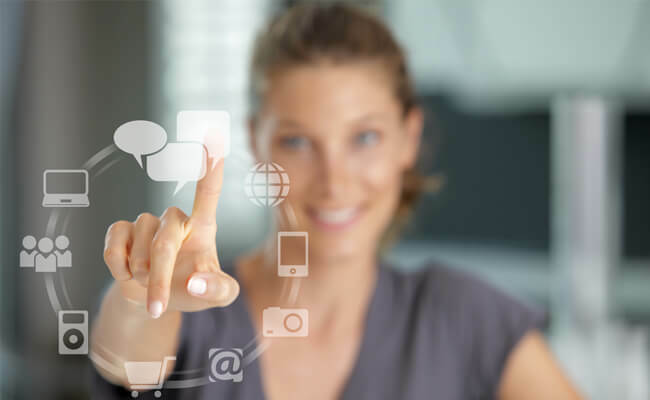 Some of these actions can be properly tracked with web analytics tools to reduce your bounce rate, including establishing events and virtual pages for external links, downloadable files and user comments. Others, such as social media mentions or offline actions, require additional measurement solutions. Loyal, repeat visitors will not take an action every time — they already know where to look for news and information — but the fact that they are returning and reading your content regularly is positive. Use time on page to more narrowly define bounce rate as “the percentage of website visitors who stay on the site for a small amount of time (usually five seconds or less).” I will discuss the complexity of measuring bounces by time on site, at a follow up article. Not all analytics tools track all online actions by default. Make sure that your bounce rate accounts for links to Twitter, Likes on Facebook, PDF downloads, video views, user comments and print-button clicks. 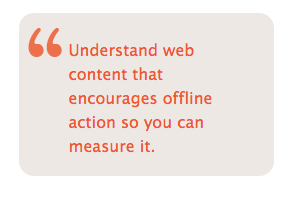 Understand web content that encourages offline action so you can measure it. One of the things analytics can’t tell you is what actions people take offline. But don’t let that deter you from learning. Conduct user research. If prospective students inquire by phone or email, ask them how they learned about your institution. Understand web content that encourages offline action so you can measure it. You can’t automatically tie offline action feedback to web analytics, but you can identify it as a key performance indicator alongside your analytics data to identify trends, including successes and unmet goals. Our content plan needs to recognize and account for the many ways people take action. Content can’t be measured by clicks alone. We need to define the right combination of web metrics to support our measurement goals. However, while no stand-alone web metric is enough to make informed decisions, bounce rate is often a great place to start. It may not account for every action a visitor takes, but it accounts for a large chunk of them and is a great lead indicator for content problems.